Stats show that 75% of all start-ups fail in the first two years, and only 5% of the ideas are able to attract Venture Capitalist. A start-up is much more than just a good idea, and should ride on strong business acumen. It needs to be financially viable and create its own space. 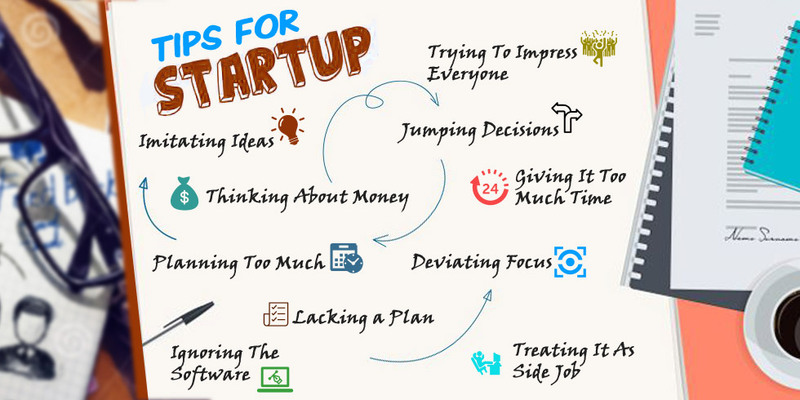 Here, we share 10 mistakes that start-ups should avoid to ensure they move beyond a mere ‘IDEA’ and become a good product or service. If you copy Facebook or even come out with a product that is technologically superior, you won’t taste even a fraction of success as it is already a spent idea. Great start-ups are ones who see an unexplored opportunity and come up with a solution. You surely want to monetize on your idea but focusing only on revenue and profits and not on the solution can kill it. Hire good employees even if it takes away your profits as you would earn rich rewards in the future. You need to have a strong business plan in terms of attracting investment, targeting customers and launching the product or service. Without one, you won’t make much headway. Take every day as it comes and don’t think too far ahead about your business. Every event, every decision would have a unique bearing on the outcome and hence you must be willing to adapt. A great idea should be executed flawlessly. Third-party technology cannot power the next big thing in the market. You need to invest in custom software solutions for startups that can meet your niche needs. You need to give your idea some time but waiting for too long may see another start-up grabbing market space. While you think your idea to be unique, someone else may also be working on it. Yes start-ups are often conceived when you are working somewhere else. But you can’t treat it as a side job for too long and need to devote your entire time and focus to make it successful. It is very easy to get carried away and deviate from your core idea, just because your investors want you to do so. But if you don’t believe in these new ideas it makes no sense to pursue them to impress your investors. Never be impulsive with decisions related investments, hiring etc. without giving it a serious thought. Make sure the pros outnumber the cons in every decision and see that they address your long-term goals. There is no product or service in the world that can impress everyone and you shouldn’t try to do so. Always focus on your target audience and make sure you offer value to them. If you are looking for a custom software development company to power your idea, Semaphore Software would be your ideal choice. Come to us with an idea and we would lend it a strong technical platform. The possibilities are immense and you can drop an email at info@semaphore-software.com to discuss them.